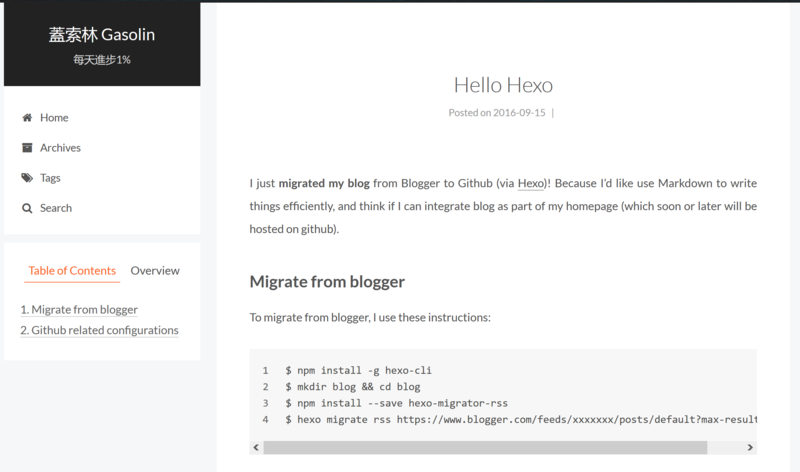 I just migrated my blog from Blogger to Github (via Hexo)! Because I’d like to use Markdown to write things efficiently (format, syntax highlight…), and think if I can finally integrate blog as part of my homepage (which soon or later will be hosted on github). xxxxxxx is your blog id which can be found from url bar of blogger’s admin panel. If you have amount of articles like me (about 500 articles), make sure you have allocate enough memory if you run the command in VM. The template comes from hexo-theme-next with great document. Make sure you’ve follow “Setting up a custom subdomain” , and install hexo-generator-cname to generate CNAME file for your static web site. You can check _config.yml and themes/ for my site configurations. The theme customization is done via npm scripts. You can check package.json::scripts for detail. Read 如何向google提交sitemap (in chinese) to send sitemap.xml to google for better indexing. to update your theme. Read Update Git submodule to latest commit on origin for more detail.